We love the mountains of Scotland and want to share our passion to explore them with you ! Our team of qualified mountain guides and leaders has a vast experience of climbing Scotland's peaks. 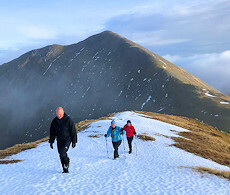 We provide a specialist service to boost your confidence and ensure you get the most out of your days in the hills and mountains of Scotland.